First of all, I'd like to say sorry for being a little M.I.A lately, but alas I have returned! Since the weather's been so miserable where I live for the past week (non-stop rain for about 6 days on the trot, oh the fun), and the week before that I was away visiting family, I haven't actually been able to shoot any outfit posts for a while so I'm starting off with a simple post focusing on one of my abso favourite stores: Lush! This is just a little haul of my top picks from their Leeds store. I actually adore the little woven baskets, so much so I was tempted to ask the woman at the till whether they, too, were for sale. 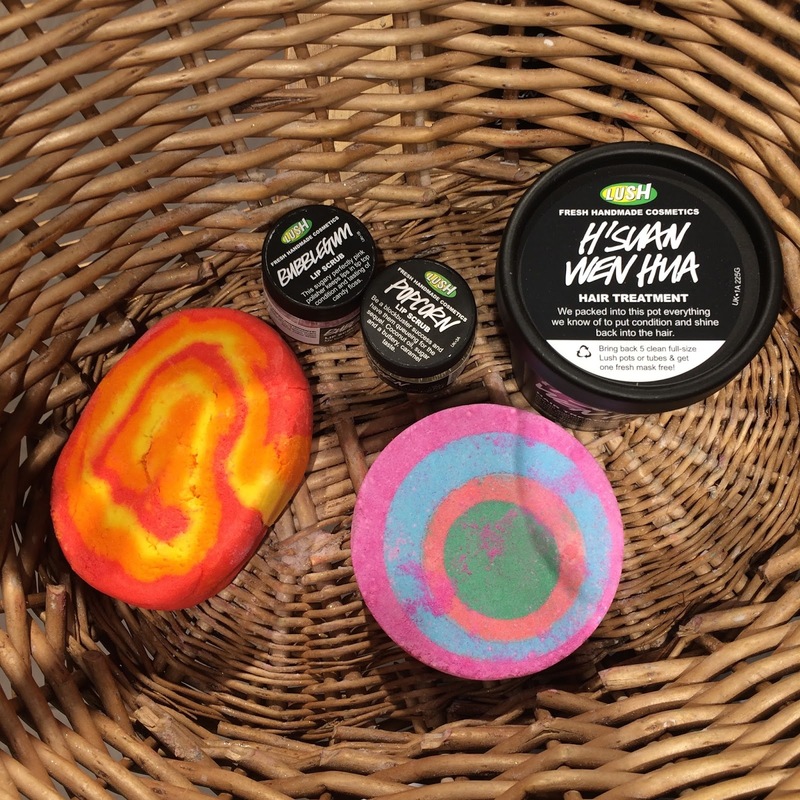 I love this 'Brightside' bubble bar (the bright orange one if you didn't guess by the name) - made with sicilian mandarin, bergamot and tangerine essential oils. 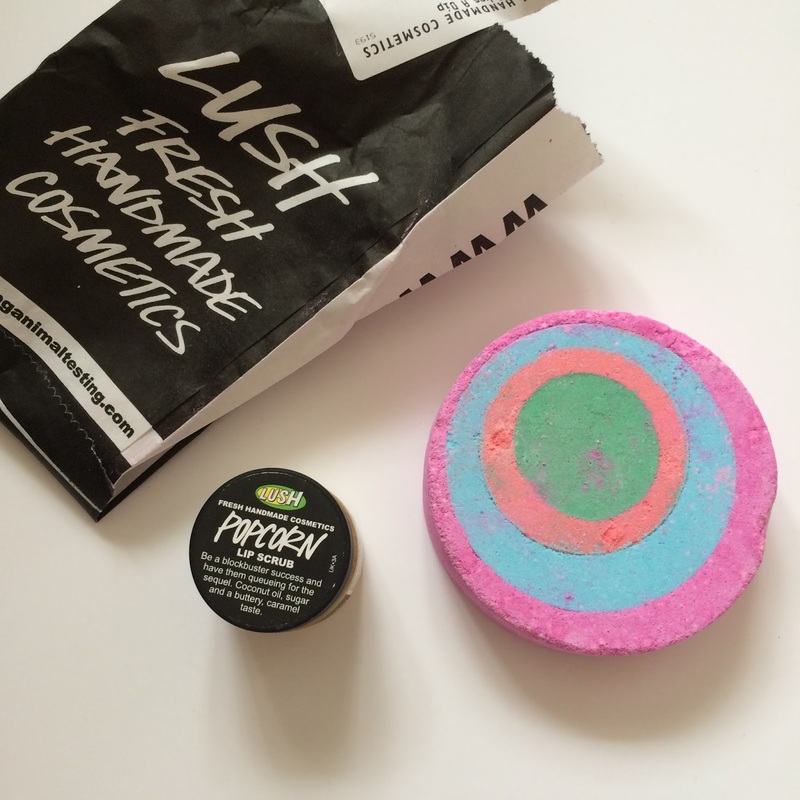 Admittedly, I thought this was just a regular bath bomb, until putting it in the bath and after several minutes of frustration spent wondering why nothing was happening, I finally realised it wasn't actually a bath bomb. Bravo me. So to save you the pain of the same mistake, I'm here to tell you do NOT just put this in the water and wait for wonderous things - crumble it under water and voila! Orange tinted and orange scented water at your fingertips. 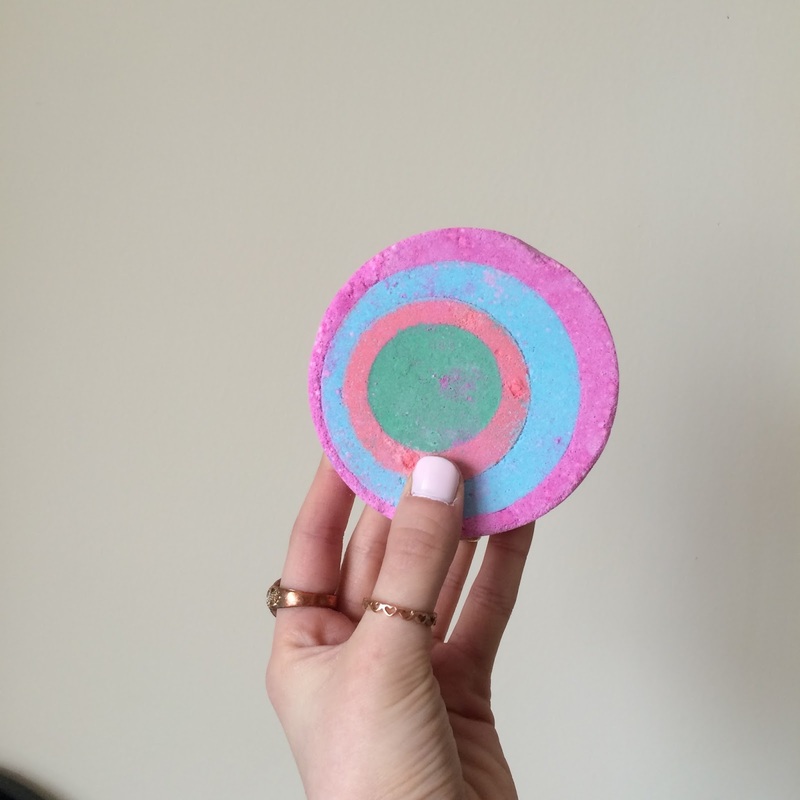 My favourite has to be this uhhmazing bath bomb, 'Granny Takes a Dip' - yes, you heard right. 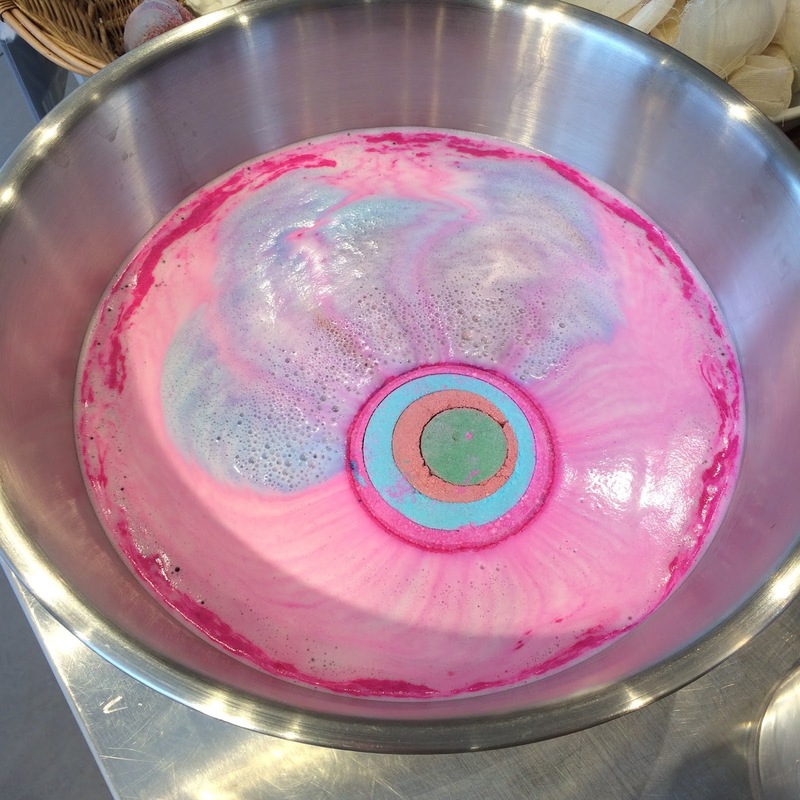 Pop this baby in the bath and prepare to witness the most wonderful-smelling colour show you ever did see. Imagine this bath bomb, but enlarged to fit your bath tub - pretty cool huh? The layers literally melt away so you're left with what I can only describe as a water rainbow, and you leave the bath with the smoooothest skin. What more could you want? The next is one of two lip scrubs I purchased - the one I'm going to talk about called 'Popcorn', and if you've read my May Favourites post (which you can read here) you'll know just how obsessed I am with popcorn anyway, so clearly I just had to get this. It claims to 'buff and prime' your lips using all natural ingredients including coconut and jojoba oils. It smells divine and it really does work, after one use my lips were softer than ever (and also tasted pretty good, if that isn't too weird to say..).